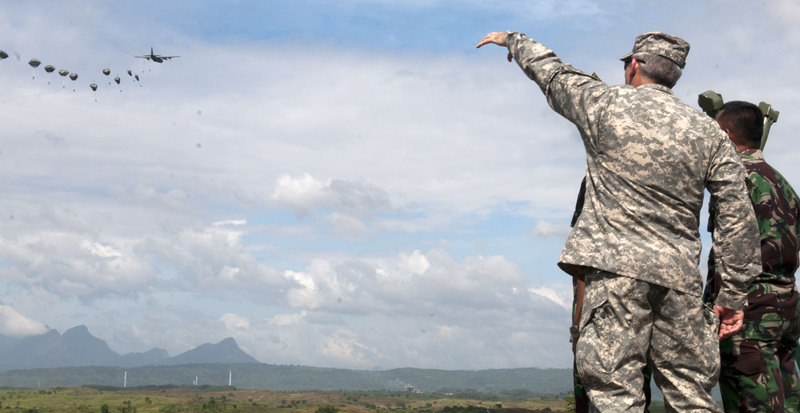 BALIKITAN, Indonesia – Soldiers from the U.S. Army’s 82nd Airborne Div. 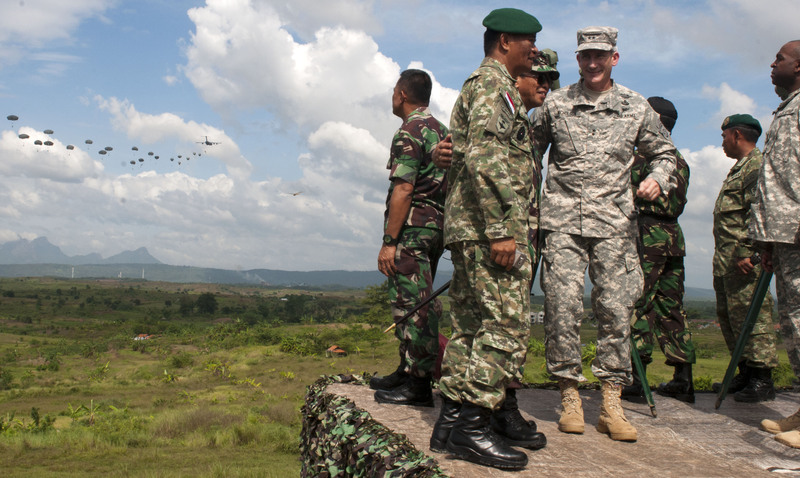 and Tentara Nasional Indonesia Angkatan Darat (TNI-AD), 17th Airborne Brigade participated in the drop, which was one of several training initiatives incorporated into US Army Pacific (USARPAC) Garuda Shield 13. The exercise was designed to strengthen military-to-military cooperation while focusing on international peace support operations. 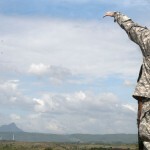 Along with a series of parachute jumps, roughly 500 paratroopers of both nations conducted infantry training and operations during the exercise, to include Jungle Survival Training, weapons familiarization and marksmanship. The exercise culminated in a joint field training exercise that joined both forces assaulting a building adjacent to the drop zone. The Hawaii Army and Air National Guard along with Pacific Air Forces joined Garuda Shield 13 by bringing a C-17 Globemaster III and UH-60 “Black Hawk” helicopter, both of which were instrumental in the airborne operations, as well as of interest to the TNI. 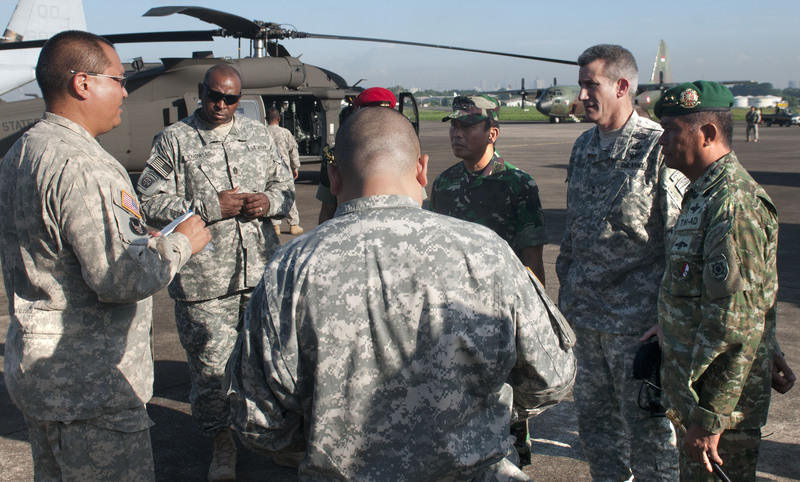 The UH-60 Helicopter was on site to provide casualty evacuation if needed and transport for U.S. and Indonesian senior leaders observing the exercise. 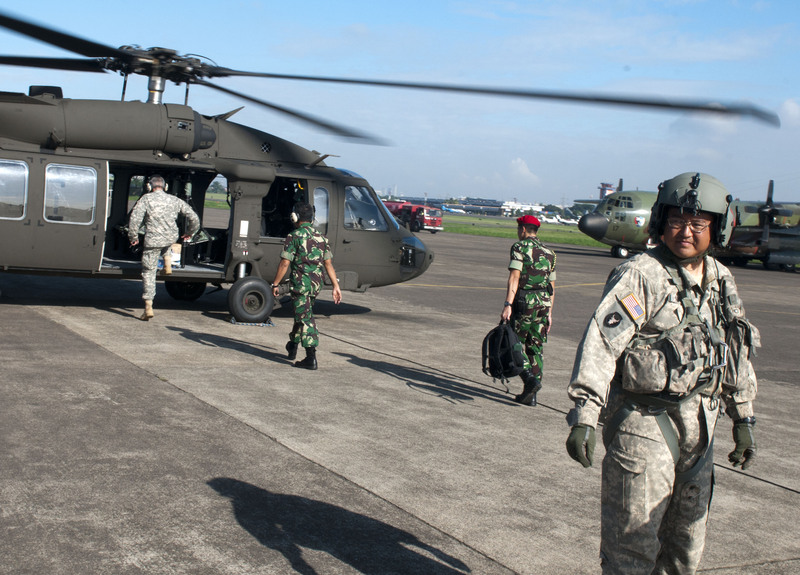 “This is the first time the Indonesians had a chance to see one, but also the first time a US Soldier brought and operated a Blackhawk here,” said 1st Lt. Ryan Hong, the officer in charge of Charlie Co., 207th Avn. During down time between flights the local military approached the UH-60 to ask questions and widen their knowledge of the aircraft. 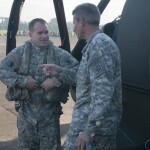 Chief Warrant Officer Jarone Amarino, UH-60 instructor pilot with Det. 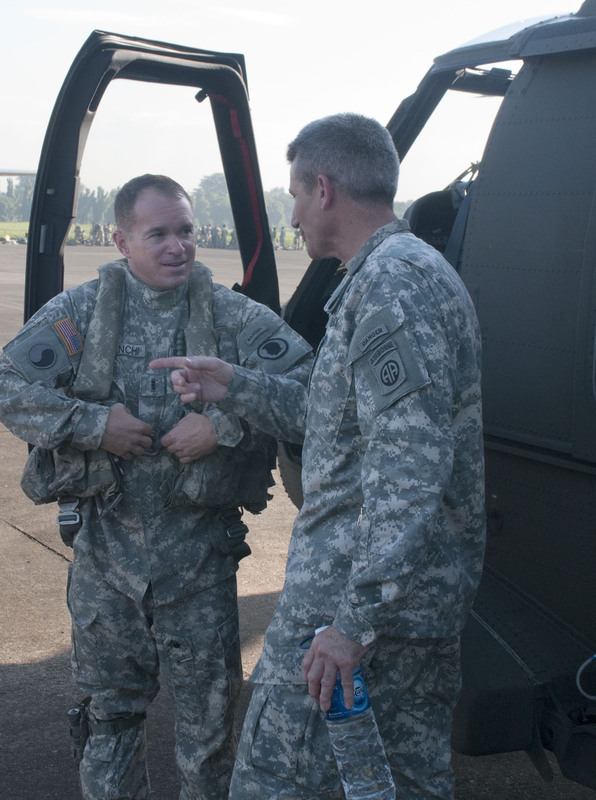 1, 207th Avn., said this was his first interaction with a foreign counterpart and he was delighted to share his knowledge with them to provide a heads-up if and when they get their own Blackhawks. 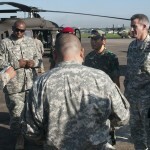 “Indonesian forces were particularly interested in seeing a UH-60 “Blackhawk” helicopter for the first time,” said Amarino. “The mission was very successful and being able to interact with the Indonesian flight crews was the most rewarding part of this experience,” said Amarino. Soldiers with Detachment 1, Charlie Co., 207th Aviation of the Hawaii Army National Guard volunteered to take on the task and provide support and aircraft familiarity to the Indonesian Army during the exercise. 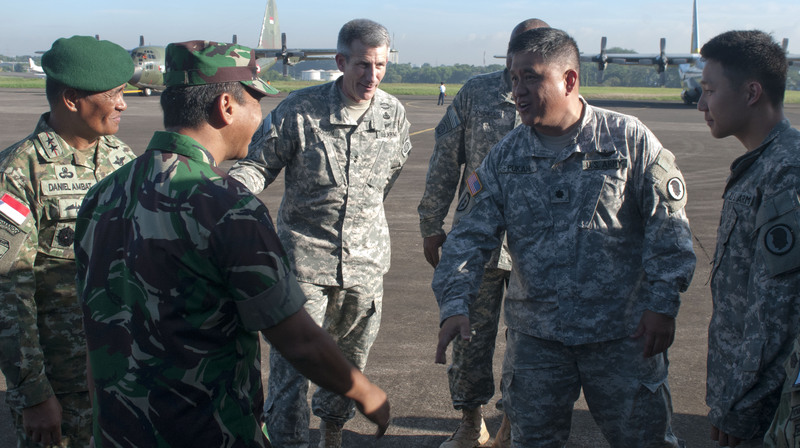 “The exercise was excellent and we were able to successfully support Garuda Shield and its goals while developing stronger relations with our hosts,” said Lt. Col. Roger T. Pukahi, the aviation officer in charge of Task Force Sayap. 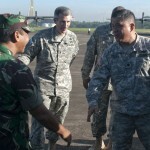 This exercise reinforces positive relations between the Hawaii Guard and Indonesia thru the State Partnership Program. Hawaii has partnership relations with Indonesia and the Philippines. 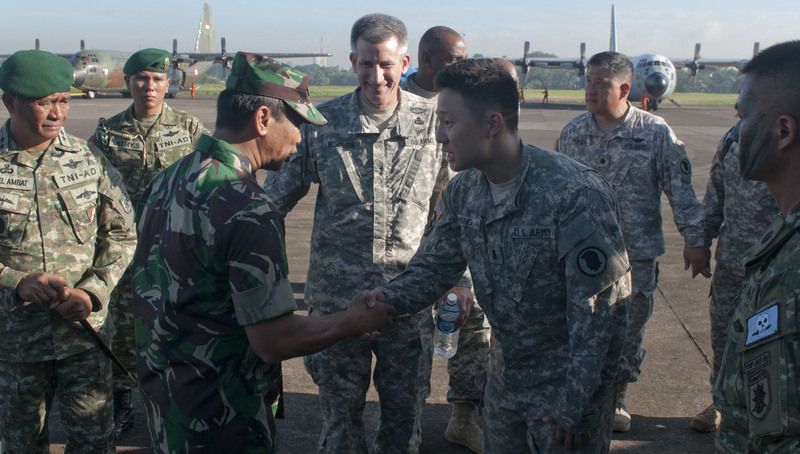 “I personally feel that being able to interact with the Indonesian military was paramount to the experience and exercises greatly improves the U.S. Army’s abilities to rapidly deploy and build relations throughout the world,” Hong said.